The project architects used StoVentec glass panels to create an unusual and dramatic new appearance for the building, and transform it into a major new focal point for the Central 7th district in Vienna. The building was designed by the Architektur Steinbacher Thierrichter practice, who specified the StoVentec glass for the main façade. 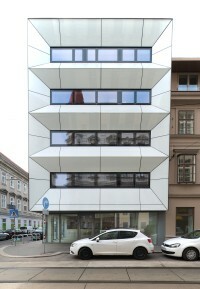 Their aim was to create a unique ‘folded façade’ which, when combined with a strict ‘3D’ structural appearance, would emphasize the building’s prominent location and mark its position on the important Westbahnstrasse street which runs into the city centre. The architects strengthened the 3D effect by contrasting the smooth, white finish of the StoVentec glass panels with black windows. The effect is further enhanced by the strong black lines of the separation gaps which were designed between the glass panels, and by the architects’ decision to restrict the palette for the rest of the building to muted colours.